Smart thermostats are all the rage these days, and for good reason. These Honeywell TH9320WF5003 models are just like your regular, programmable thermostats, except these are injected and infused with high-tech features courtesy of modern-day advancements. As a result, these units are highly innovative, and make use of several handy functions that we could only imagine in previous years. The main difference between this model and its ‘twin’ is in the price tag. This one is a little bit pricier than the other, at a price that goes a little over $200 dollars, whereas the other one is a little less than $180 dollars. Although this model is a bit more expensive, it also goes with a longer warranty of five years. Its twin model only has a 1-year warranty. For a smart model, that price is still quite affordable. After all, it does come with an array of features you will benefit from. For example, this model also gives you information on indoor and outdoor humidity, effectively giving you an hourly weather update. Now moving on to the cons, many reviewers say that they found the outdoor temperature reading inaccurate, and this is a problem that Honeywell has accepted, and is now trying to address. The displayed outdoor temperature sometimes lags, meaning it becomes late by a few hours. You can not completely substitute the thermostat’s information for your weather reports. You may also face a problem with the Wi-Fi connectivity, although this isn’t a frequent issue. Sometimes there are problems with connecting to the network, for no discernable reason. If you buy this thermostat and encounter such a problem, you should call Honeywell’s customer service for assistance. Much like any invention, the purpose of these thermostats is to make life easier for their users. Other than just simply adjusting your systems according to your desired temperature levels, smart thermostats also give you a specific bonus feature. The kind of feature you get entirely depends on the model you choose. In this case, we have the Honeywell TH9320WF5003 Wi-Fi 9000 Color Touch Screen Thermostat. On this review we will be discussing everything you need to know about this smart unit, so you can decide on whether to purchase one or not. We will do our best to list down all its capabilities, so that you know what you are spending your money on. This model in particular is like a twin sister to the Honeywell Wi-Fi Smart Thermostat, and not just because they have the same family name. They have a lot of similar features, and only a few key differences that you can take note of. Let’s familiarize ourselves with this great Honeywell TH9320WF5003 thermostat. We are not calling these two Honeywell products ‘twins’ for no reason. 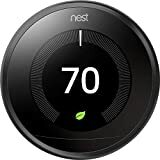 They function very similarly, in a way that the Honeywell Wi-Fi Smart Thermostat is also a touch screen device, and the Honeywell Wi-Fi 9000 Color Touch Screen is also a smart thermostat. That said, this specific unit can handle multiple appliances in your system. It can work fine while simultaneously manipulating 3 heating and 2 cooling systems. 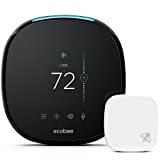 You can use this as either a programmable or non-programmable thermostat, depending on how you want your temperature adjusted. If you want to do it manually, that’s okay. But you can also program specific schedules for each day of the week. This way, you can optimize your energy saving by turning down your systems whenever you are not at home. This Honeywell TH9320WF5003 also connects to your home’s existing Wi-Fi network, instantly giving you access to the thermostat, even when you are far away. Use any compatible device such as a smartphone, tablet, or pc with the Total Connect Comfort app, and you can adjust your home to the temperature you want, even when you are in another country! You will also find it convenient that it updates automatically through the Wi-Fi, so if there are any improvements that Honeywell wishes to apply to their thermostats, that’s entirely possible anytime. All those previously mentioned features were just the surface for this Honeywell TH9320WF5003 thermostat. Inspecting it closely, you will find that it has plenty of other positive attributes going for it. You will notice these factors even during the installation process. You’ll see that it installs very easily, even without tools. This is great for if you want to do it all by yourself, and don’t want to spend a few extra dollars on professional assistance. With a bit of research, you can install this unit without aid. Once you do get it installed, you’ll see that the benefits just keep flowing in. For example, the high gloss frame of this thermostat is really simple, but very admirable. It displays everything you need to know on a single screen, simplifying confusing process of adjusting the room temperature. Not only does the laid-back frame disappear with any background, it also blends in perfectly with the help of the customizable screen color. This feature lets you choose a color scheme that matches your mood, or your home’s aesthetic. If appearance is truly your concern, this Honeywell TH9320WF5003 thermostat should ease your worries in that department. LIKE WHAT YOU READ? GET THE DISCOUNT PRICE HERE! Who knew this small, white rectangular device could hold so many useful features? Honeywell TH9320WF5003 is fully loaded with functions that ought to make your home a better place to live in. With its programmable schedules, you will always come home to the right temperature, sleep comfortably every night, and wake up to great mornings every single day. Gone are the days wherein you have to suffer through a cold morning, or get sweaty during an awfully hot summer afternoon. While many thermostats make this possible, a smart model such as this one can even help you out with your electricity bills. You’ll be saving a lot of money with the right control of your heating and cooling systems. With its easy-to-install and easy-to-use design, this creation by Honeywell will find its way into the homes of many users. NOT SURE ABOUT HONEYWELL TH9320WF5003? THEN GO THROUGH OUR OTHER THERMOSTAT REVIEWS.